What Else Can I Expect From an Online Bachelor’s in Writing Program? Professional writers are the minds behind the content we read every day. Some specialize in creative compositions, such as novels, short stories, theatrical scripts, screenplays, and songs. Alternatively, technical writers produce how-to guides, product manuals, brochures, and other materials that consumers use. Other writing majors find their calling in journalism, crafting articles and editorials for newspapers, magazines, and academic journals. Regardless of their specific job title, most writers begin their career as undergraduate students pursuing a bachelor’s degree in writing. Many colleges and universities offer degrees dedicated to writing, while others offer English degrees with a writing concentration track. Most writing programs involve workshopping, where students compose drafts and then submit them to fellow students for peer review. Other courses cover topics like grammar and composition, comparative literature, editing, and publishing. Today, students often choose to earn their bachelor’s degree in writing online. Web-based programs offer the same rigorous curricula as brick-and-mortar options, leading to the same job opportunities after graduation. The asynchronous or self-paced schedule of many online writing programs may benefit students with part-time jobs, childcare needs, and other commitments that may interfere with campus-based learning. Use this guide to learn more about what you can do with an online bachelor’s degree in writing and what kind of career opportunities you can look forward to in the field. WILL AN ONLINE WRITING DEGREE PROGRAM PROVIDE ME WITH THE SKILLS I NEED TO ADVANCE MY CAREER? Online writing programs build on the fundamentals of English grammar and composition that most students first learn in middle and high school. Courses cover methods and techniques for crafting comparative essays, academic research papers, speeches, short stories, poems, and other creative works. The best online writing degrees also incorporate vocational training in areas like technical writing, copywriting, and grant writing. In recent years, many writing programs began including elements of web marketing, blogging, and social media. WILL AN ONLINE WRITING DEGREE PROGRAM WORK WITH MY SCHEDULE? Online bachelor’s in writing programs offer a flexible alternative to traditional, classroom-based education. Students can access course readings and writing tutorials, participate in virtual class discussions with fellow students, submit written assignments, take exams, and communicate with professors from the comfort of their own home. Current eLearning technology also allows learners to study on the go using a laptop, tablet, smartphone, and other Wi-Fi-compatible devices. WHAT JOBS CAN I GET WITH MY WRITING BACHELOR'S DEGREE? Job availability for graduates of an online writing bachelor’s program largely depends on the specialization area. Students with a background in technical writing often find work quickly, producing or managing content for manufacturing and retail companies, marketing firms, nonprofit organizations, and government agencies. Those who focus on creative writing may also find employment in content-producing roles, working on literary submissions for book publishers and literary journals. Jobs in journalism -- both print and online -- are widely available to writing majors as well. Other common pathways for writing majors include careers in editing and publication, marketing, and education. WHAT ARE THE BEST ONLINE WRITING DEGREE PROGRAMS? Only you can decide whether a target school’s strengths match your educational needs. The following ranked schools should serve as a helpful starting point in your search for the best online bachelor’s degree in writing programs in the U.S. When considering an online bachelor’s in writing, be sure to contact admissions specialists at different colleges and universities to learn more their about specific requirements and offerings. A major public college based in Orlando, the UCF enrolls more than 68,000 students annually, with many served through an extensive distance education program. The school's online bachelor of arts in English with a concentration in creative writing builds skills in rhetoric and written communication, helping students develop both their creative and professional writing abilities. UCF offers a fully online creative writing degree, as well as hybrid options. Creative writing students complete courses in composition techniques, literary history, writing workshops, and professionally focused electives. Required core courses include creative writing for English majors, theory and techniques of literature study, and theory and practice of creative writing. After completing core requirements, students explore advanced topics in pre- and post-1865 literature. UCF offers a large selection of literature courses covering various periods, movements, and authors, from Shakespeare studies and Gothic literature to modern American poetry and continental European fiction. Students should note that not all courses are available online, and course availability can change by semester. The elective section offers one of the creative writing program's defining experiences: the writing workshop. Students select from fiction, poetry, creative nonfiction, and screenwriting, with the option to complete workshops in multiple genres. An additional elective offers the opportunity to explore the professional side of the field, with course options such as literary magazines and editing for creative writers. For students able to travel to campus, UCF offers credit for working at The Florida Review, a national literary journal. A fully online college based in Albany, New York, Excelsior meets the needs of working students through a flexible education model that includes asynchronous courses and yearly start dates. The school offers a bachelor of science in liberal arts with a concentration in professional and technical writing, a career-focused degree that explores writing and editing for an assortment of industries. These include business, technology, medical science, nonprofits, and government agencies. The technical writing degree online curriculum requires a minimum of 18 credits of professional and technical writing courses, including one introductory course and five advanced courses. Students gain a broad understanding of key topics in professional communication, including digital literacy, grant writing, print and electronic publishing, rhetorical theory, and usability testing. Excelsior offers a generous credit transfer policy along with a credit for prior learning program. This enables students to earn credit for relevant professional experience and workforce training. As a fully online college, Excelsior offers a wide variety of support resources for distance learners, including academic advising, writing tutoring, career counseling, and technical support. Academic advisers serve as the primary point of contact for students, assisting with degree planning, course selection, academic issues, and connections to other school resources. The online writing lab offers free tutoring for all types of college writing, along with informational resources on the writing process. The campus library provides access to online databases and other digital resources, along with individualized research support from librarians. Operating multiple campuses around the Phoenix metropolitan area, Arizona State University also hosts one of the country's largest online programs, enrolling more than 25,000 students annually. ASU's bachelor of science in technical communication trains students to make complex technical information comprehensible to general audiences, creating written and visual content for instruction manuals, training materials, grants and proposals, and other formats. The degree focuses on best practices for creating accessible, appealing, and practical communication by using traditional methods such as writing, and developing methods, such as infographics. Graduates pursue a variety of positions related to communication and the presentation of information, such as information development, grant writing, web interface design, and usability consultation. The online writing degree curriculum consists of 40 courses, each offered in condensed 7.5-week blocks. Typical courses include principles of web authoring, visual communication, content management and topic-based authoring, information and communications technology in American history, and copyright and intellectual property in the electronic age. During the final semester, all students complete a capstone project that requires the creation of a professional portfolio synthesizing undergraduate coursework. The college offers a lenient credit transfer policy, but candidates must complete at least 30 credits at ASU to earn their degree. ASU offers a generous selection of resources for distance students, including free online tutoring and individualized student coaching. The school's online platform offers live tutoring sessions covering all types of writing assignments, while student success coaches offer academic advice and support for new students adjusting to the online environment. A private Christian college in Virginia Beach, Virginia, Regent offers two writing programs online: a bachelor of arts in communication studies with a concentration in professional and technical writing and a bachelor of arts in English with a concentration in writing. Both degrees require 120 credits and use a fully online delivery format. Regent grounds its academic programs in a Christian framework that requires students to take introductory courses in Old Testament studies, New Testament studies, and Christian theory. The communication studies degree explores effective communication techniques in media, advertising, public relations, and other professional fields. Students examine the impact of technology on modern communication practices, gaining the skills to deliver messages to diverse audiences through various channels. The curriculum presents an expansive overview of communication theories and techniques, including courses in narrative concept and development, communication ethics, and communicating in the 21st century. Students also complete several English courses focused on writing, including business writing and professional editing. The English pathway features a large selection of courses in technical, professional, and creative writing. Regent offers a flexible curriculum that allows students to pursue their area of professional interest, with courses focusing on several types of writing. As with any English degree, candidates complete several courses in English literature, but the curriculum also features varied writing courses such as writing for animation, the art of the essay, and creative nonfiction and feature writing. Students can also complete an independent study course into an approved topic of their choice. Located in Hooksett, Southern New Hampshire University emphasizes distance education.. The school's online bachelor of arts in English and creative writing explores the practice and theory of storytelling, encouraging writers to develop their own craft while studying the history of language and literature. The program offers four concentrations in fiction, nonfiction, poetry, and screenwriting. Courses use a primarily asynchronous format that enables online learners to complete work without required class meeting sessions. 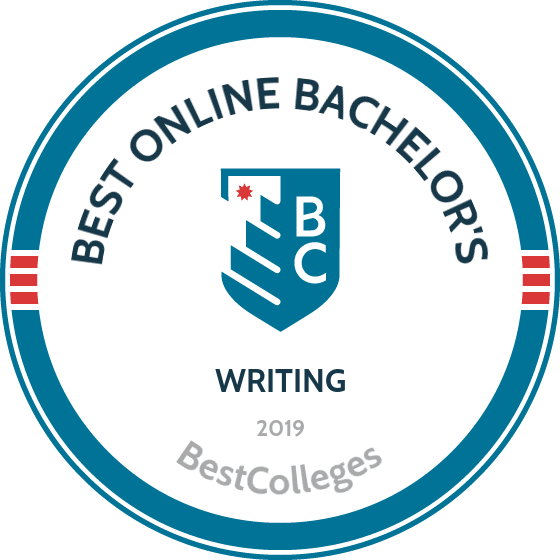 The online creative writing bachelor's degree includes a 33-credit major section, requiring 24 credits of core courses and nine elective credits. The major core covers key topics such as the English language, advanced creative writing, literary theory, and the context of writing/publishing. Major electives include writing workshops and internships, with candidates required to complete three writing workshops in their concentration area (introductory, intermediate, and advanced). Students can eschew a concentration track, completing multiple workshops in different concentrations. By the program's conclusion, students produce an advanced body of work that demonstrates the development of writing craft and professionalism. SNHU offers several opportunities for experiential learning and internships, enabling students to apply their literary training to supervised work experience. Students can perform internships at literary journals, publishing houses, literacy organizations, or other professional settings related to reading and writing. SNHU's own online literary journal, The Penman Review, provides a platform for students to publish their work..
One of the largest colleges in Missouri, Missouri State University enrolls more than 23,000 students annually, offering on-campus programs and fully online degrees to distance learners in-state and around the country. The school's bachelor of science in professional writing program emphasizes clarity and precision in written communication, giving students the skills to help audiences perform tasks, make decisions, and solve problems through writing. Degree candidates can choose from several related online minors, including communication studies, information technology/service management, and screenwriting. The program requires 36 credits of major coursework, divided between 24 credits of core writing and 12 credits of writing electives. Core courses offer an overview of technical writing practices, addressing topics such as scientific and technical editing, analysis of scientific literature, and advanced nonfiction writing. Electives move into specialized areas of professional writing, such as writing in the health professions and grant writing. All candidates complete a technical writing internship, which requires at least 135 hours of supervised work in a professional writing-related environment, such as academia, businesses, or nonprofit organizations. MSU provides significant support for its online learners, including academic advising, tutoring, and career services. After declaring an English-related major, all students receive individual support from academic advisers, who assist with degree planning and fulfilling major requirements. Peer tutors help with academic assignments, and the school's online platform allows distance learners to receive tutoring remotely. Career counselors also help connect students to job opportunities before and after graduation. One of the state's largest public colleges, Minnesota State University, Mankato serves over 15,000 students annually through on-campus and distance programs. The school offers an online bachelor of science in technical communication, training students to convey ideas and information through written and verbal communication. The degree offers significant flexibility for working students, with asynchronous courses and a fully online format that requires no campus visits. With full-time study, most candidates complete the degree in about four years. The program requires 37 credits of major courses and a recommended technical minor, such as computer technology, civil engineering, or community health. The 19-credit major section includes a selection of introductory courses, such as research and writing technical reports, editing technical publications, and either technical or business communication. Electives offer a variety of specialized studies into topics such as document design, visual technical communication, desktop publishing, and rhetorical applied theory to technical documents. Most degree candidates complete a 3-4 credit internship as part of the program core. Taking place in an approved professional environment, the experience allows students to apply their technical training to actual writing practice, gaining a practical understanding of industry standards. Most internships last 15 weeks and require a minimum of 135 hours of field placement work. Students with relevant professional experience may petition to substitute an upper-level elective course for the internship. Those with significant professional writing experience may also be able to forgo some courses through the completion of credit by examination. A small, public college based in Richmond, Indiana University East enrolls around 3,200 students. The school's online bachelor of arts in English, technical and professional writing functions as a completion program, requiring candidates to complete 60 credits (equivalent to an associate's degree) at another institution before transferring into the technical writing program. IU East offers several start dates throughout the year, making it convenient for students to begin the program when it fits their schedule. Candidates complete the online writing degree in about two years of full-time study. Students transferring into the program must hold a GPA of at least 2.0. Candidates must complete at least 30 credits at the 200 level, and at least 15 credits of technical and professional courses to earn their bachelor's degree from IU East. Depending on lower division coursework, some students may be able to skip certain required major courses, completing the degree faster. The degree curriculum requires 60 credits spread across 20 courses. Students complete a wide selection of courses that explore topics in literature, composition, and professional writing practices. IU East offers flexibility in course selection, with several options available to fulfill most credit requirements. The degree does include required courses in introduction to advanced study of literature, professional writing skills, technical editing, and advanced technical writing. Students also complete a variety of literature courses, such as studies in American culture and American ethnic and minority literatures. Founded in 1996 as the online extension of the University of Colorado Denver, CU Online ranks among the country's oldest accredited distance education programs. The school's bachelor of arts in English writing introduces students to the broad applicability of professional writing, offering specialization options in communication, creative writing, digital production, and journalism. The curriculum explores various professional contexts of writing, from academia and publishing to technical and business writing. CU Online offers three start dates throughout the year, with most courses lasting 15 weeks. The program offers full-time and part-time enrollment options, with courses using a mixture of synchronous and asynchronous material. Students can complete the online writing degree in four years of full-time study, with summer enrollment options available for those who wish to complete the degree faster. Students complete a minimum 36 credits of English major courses, split between 15 credits of core courses and 21 credits of elective courses. The program core covers key topics in rhetoric, multimedia composition, and language, along with two advanced courses in writing and digital studies. The elective section allows students to explore specialized areas of writing, with more than a dozen course options available. Courses focus on a wide selection of writing practices, such as travel writing, writing in the sciences, proposal and grant writing, business writing, and technical writing. Candidates also complete a senior writing project in their chosen genre and discipline, resulting in the creation of an original 30-page manuscript. Part of the Indiana University System, IU Online is a sizeable distance education program with enrollment from around the country. The school's online bachelor of arts in English with a concentration in technical and professional writing emphasizes accuracy and clarity in writing, preparing graduates to communicate information in writing-related fields such as technical writing, copywriting, and medical writing. The program occurs entirely online, with no campus visits required. Distance learners also take advantage of a flexible enrollment format, with options for full- and part-time study. The major curriculum includes 48 credits of English core courses, nine credits of literature elective courses, and three credits of language courses. The program core builds versatile skills in writing and critical thinking, with courses including digital writing, technical editing, and advanced technical writing. Electives explore various literary movements and periods through courses such as American fiction to 1900, Native American literature, studies in British or commonwealth literature, and studies in American culture. IU Online offers a robust support system for distance learners, including admissions advising, academic coaching, tutoring, and technical support. Admissions counselors offer personalized support for incoming students, helping with class selections and the online learning environment. Academic coaches work with students one-on-one to develop successful study strategies and map out educational goals. Students can meet with peer tutors online for help with writing assignments, and IU Online also offers 24-hour technical support via real-time chat, phone, and email. A major public college based in Iowa City, the University of Iowa serves more than 32,000 students annually through a large assortment of on-campus and online programs, including a bachelor of applied studies with an emphasis in creative writing. Requiring 120 total credits, the program builds generalized knowledge and skills across several disciplines, including humanities, communications and arts, natural sciences, and social sciences. UI's online courses use a mixture of synchronous and asynchronous materials, with some courses using live virtual meetings requiring students to log in at set times each week. The creative writing emphasis comprises 18 credits, divided between nine core and nine elective credits. The emphasis requirement includes three courses: building English vocabulary, creative writing, and novel writing. The elective section allows students to explore several genres of writing, with course options including fiction writing, poetry writing, playwriting, and creative business writing. Creative writing majors can also explore courses that dive into specialized topics like sentences and revision strategies. Unique among most online creative writing degrees, UI offers a 1-3 credit course known as writing commons: building a community of writers. Examining both literary and classroom communities, the course encourages students to reflect on their own writing as well as the communities in which it exists. Throughout the course students participate in writing workshops and complete an examination of a trend, tradition, or venue within their community. By the end of class, students develop a portfolio of polished fiction and nonfiction writing. Based in Morgantown, West Virginia University ranks among the largest public colleges in West Virginia, serving more than 29,000 students annually. The school's online bachelor of arts with an emphasis in professional writing explores theoretical and practical approaches to writing in a professional context, training students to create business and technical documents. The professional writing specialization focuses on the varied roles writing plays in professional organizations, the nature of accessibility and effective communication, and the use of visual communication (such as graphics and design) to facilitate written messages. Students also gain understanding of the conventions of writing and their application to various types of professional communication, such as memos, reports, and instructions. The professional writing emphasis includes six credits of prerequisite courses and 15 credits of required courses. Perquisites introduce the basics of rhetoric and composition, focusing on expository writing practices, research strategies, argumentative models, and formatting styles. The requirements section focuses on more advanced topics in writing theory and editing. WVU offers some flexibility in course selection; for example, students choose between courses in multimedia writing or topics in humanities computing. With full-time enrollment, students can complete this technical writing degree online within four years. The writing program ends with a capstone field experience that places students in a professional environment for one semester. Often occurring at a business or nonprofit organization, the field placement offers candidates a chance to observe professional writing practices and make industry connections. Students typically work with WVU to arrange a field placement within their community. A private Christian college and seminary based outside Dallas in Waxahachie, Texas, Southwestern Assemblies of God University serves around 2,000 students through on-campus and online programs, including an online bachelor of arts in English with a concentration in writing. This fully online program offers an introduction to literature, literary history, and writing practices. The online creative writing degree requires 43 credits of English major courses, divided between the English core and the writing concentration track. The 27-credit English core includes courses in grammar, composition, linguistics, literature, and creative writing.. The 15-credit writing concentration examines various forms of writing, with course options including children's literature, rhetorical studies in film, and scriptwriting for theater and film. Students also select from several courses in writing and publishing, examining poetry, nonfiction, short fiction, and long fiction in an academic and industrial context. Students can combine the writing track with courses from other tracks in literature and teaching English to speakers of other languages. SAGU's distance education program primarily serves students age 22 and older, and the school offers opportunities to earn up to 45 credits with work experience, and other forms of prior knowledge through its experiential learning credit program. Students with relevant training may enroll in a portfolio development course during their first semester, after which they submit a portfolio of their experiences for credit evaluation. University of Arkansas at Little Rock's online bachelor of arts in professional and technical writing focuses on rhetorical and written literacy, encouraging students to develop their skills in writing, editing, reading, and document design. The program offers two concentration options in nonfiction and technical writing. The nonfiction track primarily explores essay writing, with a focus on persuasive writing. The technical writing track focuses on professional writing, such as technical, legal, business, and grant writing. The 36-credit writing major comprises of a 21-credit foundation section and a 15-credit concentration section. The program foundation includes seven courses and introduces key topics in rhetoric, persuasive writing, document design, technical writing, and nonfiction writing. The concentration section enables students to build deeper knowledge in their chosen focus area, with a variety of course options available. For example, the nonfiction concentration includes courses such as introduction to research, advanced persuasive writing, publishing inside out, topics in nonfiction writing, and technology of the book. UA Little Rock's online writing degree also requires students to demonstrate proficiency in a second language, typically Spanish, French, German, or American Sign Language. Online students with prior language training can demonstrate proficiency either by taking a placement test or presenting transfer credits in college-level language studies. Native English speakers without second language proficiency can complete three online courses to satisfy the requirement: elementary Spanish I, elementary Spanish II, and intermediate Spanish. Students with training in a language other than Spanish, French, or German can contact the college's Department of International and Second Language Studies to determine alternate methods for demonstrating proficiency. Based in La Jolla, California, National University offers a bachelor of arts in English with a concentration in creative writing. The fully online program emphasizes literary analysis, written and verbal communication, critical thinking, and diversity in perspectives. Creative writing majors gain an understanding of at least two major genres of writing (fiction, poetry, or screenwriting), deepen critical and revision strategies, and produce a significant literary work in their chosen genre. The online creative writing degree includes 54 major credits and 36 creative writing concentration credits. Students complete several preparation courses for the creative writing concentration, including introduction to literature and two writing genre courses, with options in fiction, poetry, and screenwriting. The English major itself includes a wide selection of survey courses that cover British literature, American literature, world literature, and literary theory. Students also select from courses in African-American literature, Latino literature, and gender in literature. All candidates end the program with a capstone course that results in an original work of literary scholarship. The creative writing concentration includes eight courses, divided between writing courses and literature electives. Candidates first complete two advanced writing courses, with options in fiction, poetry, screenwriting, and nature writing. The concentration also includes one required workshop course in either fiction, poetry, or screenwriting, and one contemporary literature course in either fiction or poetry. Students fulfill the remaining concentration requirements with two upper division literature electives, and two upper division courses selected from the College of Letters and Sciences. Heather E. Schwartz is an independent book producer, marketing consultant, and author based in upstate New York. Her authoring credits include branded titles for Disney, Sesame Street, Time for Kids, and the Smithsonian. She has also worked on projects for the Arthritis Foundation; Bridal Guide, Discovery Girls, and National Geographic Kids magazines; and NASA. She graduated from SUNY Potsdam in 1992 with a bachelor's degree in writing. Why did you choose to pursue a bachelor's degree in writing? Did this field always interest you? I was always interested in writing and wanted to be a professional writer. I didn't really know what kind of job opportunities I'd find, but I knew I wanted to write. What would you say are some of the most crucial skills you gained in your bachelor's program? We did a lot of writing, of course, so that was good practice, and we learned about different kinds of writing: essays, marketing and public relations, journalism, fiction, etc. We also critiqued each other's work, which was some practice in editing. What was the job search like after you earned your degree? Did you feel prepared to make the transition from school to the workplace? During my senior year, I did an internship at a daily newspaper in my college town. That really helped with the transition because, in a sense, I was already in the workforce. It was still a winding road, however. I knew that, ultimately, I didn't want to work at a newspaper, so after graduation I didn't pursue a job in that field. After about a year of temp jobs, I went back to the same newspaper where I did my internship and worked full time for a year. It was a fantastic experience and I was so glad I did it, even though I still didn't want to work in newspapers. I learned so much about how to be a professional writer by working there. Out of your various types of writing experience (newspapers, magazines, and children's books), which do you prefer, and why? It's hard to pick just one! Newspapers taught me a lot about working to deadline, interviewing sources, editing, and more. I loved the fast pace of each day. I got a solid foundation of experience there and was lucky enough to have an editor who was a real mentor to me. I enjoyed magazines mainly because, at one particular national magazine, I loved the team of editors I worked with and I loved the variety in my job. I wrote, but also edited and produced pages, which meant planning content and coordinating photo shoots. I built on my experiences at newspapers and magazines to get freelance work writing children's books for educational publishers. It's fun because I always wanted to write for children, and the topics are really interesting. I work on assignment, so it's a great way to have some stability as a freelancer. How has your experience as a writer informed your experience in book producing? Throughout my career, I've always assessed the market, pitched ideas, created artwork, collaborated with artists, and worked with publishers and editors to develop successful projects. I enjoy every aspect of creating books and decided to move into book producing because I realized, at this point, I'm already doing it! What are some changes you'd like to see in the typical curriculum for a bachelor's program in writing? I can't say I'm completely familiar with the curriculum currently being offered. However, I do remember that one of my favorite courses was in public relations. It was taught by the person who handled public relations for the college, and it felt very applicable to the real world. We wrote press releases and scripts for promotional videos and worked on other assignments that taught me about writing in the real world. What advice would you give to students considering earning a bachelor's in writing? It's a great degree to pursue if you love writing! Naturally, it's very valuable if you want to write professionally, even if you don't know exactly what you want to do. It can prepare you for work in newspapers, marketing, public relations, publishing, and other writing-related fields, and it's also useful to have strong writing skills for work in other fields, too. For an idea of what you might learn within your writing coursework, take a look at the list below. Every writing program operates differently, which means each school offers varying courses. Moreover, each professor runs his or her course in a unique way. The classes below only represent a portion of what you might learn throughout your degree, but they include some of the best online creative writing courses available. Short Story Writing: This course instructs students on how to write fiction in short story form. Professors sometimes run short story writing courses as workshops. Students bring in their story drafts for the class to critique. Learners study story form and other aspects of writing, such as metaphorical language, point of view, and characterization. Poetry Writing: Much like the short story writing class, poetry courses often operate in a workshop format. Students write poetry, critique each others' poems, and examine the craft of poetry. Professors use examples of literature from revered poets, and students learn about poetic conventions like rhyme and meter. Nonfiction Writing: Nonfiction writing exists in several forms, including journalism, essays, criticism, and creative or literary nonfiction. Students learn about what sets nonfiction writing apart from poetry, short stories, and novels. Learners also study how to use the creative process to bring nonfiction writing to life and make it interesting for readers. Screenwriting: Writing for the screen means relying heavily on dialogue, action, and drama. Sometimes, screenwriting courses focus specifically on television. This means students learn about character development and unraveling plot over several hours of content and a series of episodes. Novel Writing: Writing a novel might seem like an intimidating task. This course teaches students how to develop the discipline to keep at a long-term writing project. Professors also often examine the great novelists like Jane Austen and Charles Dickens, teaching structure and literary conventions using these authors’ example. How Long Does It Take to Get an Online Bachelor’s in Writing? A traditional bachelor's degree consists of 120 credits and lasts about four years. If students work full time or have family responsibilities, they often enroll in school part time. These students may take a longer to graduate. Sometimes, students opt to pursue a technical writing master's degree online after their bachelor's degree, which can demand additional time. That said, earning a technical writing degree online does not necessarily follow a conventional timeline. Several factors affect how quickly students finish their degrees. For instance, some students may possess transfer credit from an associate degree or previous higher education experience that can shorten total degree length. Sometimes, schools administer special programs or incentives to help students finish their degrees. Accelerated and fast track options allow students to take additional credits each semester or enroll in coursework during the summer. Accreditation acts as a guarantee of quality, as accrediting agencies review schools and programs for the highest standards of education. If the institution meets certain standards, it receives accreditation. Both students and prospective employers can be assured that a degree from an accredited university meets the highest standards in education. Accrediting agencies come in two different forms: regional and national. National agencies serve higher education programs all over the U.S., not specific to a certain region. National accreditation agencies typically review for-profit and vocational schools. On the other hand, regional accreditation agencies serve colleges and universities in one specific region of the country. Generally speaking, regional accreditation agencies hold higher esteem than national accreditation agencies. However, some of the best colleges for creative writing possess accreditation from both. Additionally, programmatic accreditation agencies typically review degrees that fall within a specialized field like nursing or business. Writing students should look out for degrees with accreditation from the Commission on English Language Accreditation (CEA). The federally-run Department of Education (ED) accredits the accreditation agencies and oversees agencies acknowledged by the federal government. The Council for Higher Education Accreditation (CHEA) holds a similar purpose. Made up of colleges and universities, CHEA aims to self-regulate the accreditation process. These two organizations work to ensure that accreditation agencies do not exploit the process or grant accreditation to every school so that the distinction becomes meaningless. For more information, you can find a full list of accredited schools on the ED's website. Professional writers often earn more if they hold a technical writing degree, but experience matters too. Writers who have worked in a field for a while may receive a higher salary than recent graduates. The table below examines how salaries for specific positions change over time. The data, which comes from Payscale, outlines what professionals make early in their careers, during the middle of their careers, and toward the end of their careers. For some positions, a new professional and a seasoned professional may see a $20,000 difference in their annual earnings. Writers sometimes work for agencies, newspapers, or other organizations. They may compose copy in-house or report the news. Other times, writers work in a freelance capacity. This means they must hold excellent time management and self-discipline skills. They should also feel comfortable working on their own, although they often communicate with coworkers through email or other digital means. For more information on positions for professionals who have earned their technical writing degree online, check out the following list of potential careers. Writers and Authors: Writers and authors take on a variety of roles. Authors usually write books or short stories, which they may publish independently, through a publishing house, or in a literary journal. They might also work as screenwriters, penning films and television episodes. Nonfiction writers record true stories, while copywriters compose pieces for advertising agencies or websites. Technical Writers: Technical writers create content that helps consumers understand difficult concepts. Specifically, they might write an instruction manual for putting together a piece of furniture. They could also write how-to guides for equipment or warnings on product labels. Technical writers must possess a solid comprehension of their assigned topic. Editors: Although many work for news organizations, editors can also work in a variety of different workplaces, including advertising agencies, universities, or nonprofit organizations. Editors review writing to clean up mistakes and ensure the finished product lives up to the organization's standards and tone. News editors also take an active role in reporting the news by guiding reporters on article presentation. Reporters, Correspondents and Broadcast News Analysts: Reporters and correspondents bring news to the public for online news organizations, newspapers, or television newscasts. They must pitch stories, conduct interviews, write, and -- if working for television -- film a segment around the those stories. Broadcast news analysts appear on TV news programs to break down and interpret the news. Professional organizations provide a great entry point for students who want to learn more about their chosen career path. Below you can find three of the country’s most prominent organizations established for professional writers. These organizations host networking events, provide online trainings, maintain active job boards, and offer other services for career-ready college graduates. Society of Professional Journalists: Founded in 1909, the SPJ now represents roughly 7,500 members nationwide. The organization’s flagship magazine publishes 10 times per year, and the website features jobs leads, professional development courses, and an extensive resource library. Association of Writers and Writing Programs: The AWP offers membership, career resources, and advocacy to writing professionals across the country. The organization represents more than 550 college writing programs and 150 nationwide writer’s conferences. Society of Children's Book Writers and Illustrators: This organization offers training, grant support, and advocacy for writers and illustrators of books aimed at young readers. The SCBWI maintains more than 80 regional chapters around the globe. Approximately two-thirds of today’s college students rely on loans to fund their education, but many overlook financing options for reducing overall student debt. Online programs can provide an affordable and flexible option for women trying to balance the demands of work, family, and earning a degree. We’ve curated a list of valuable scholarships specifically for women. Online college programs can be a flexible, affordable option for single parents interested in earning a degree and securing their family’s financial future. We’ve compiled a list of scholarships, grants, and other financial aid options geared toward single moms and dads.